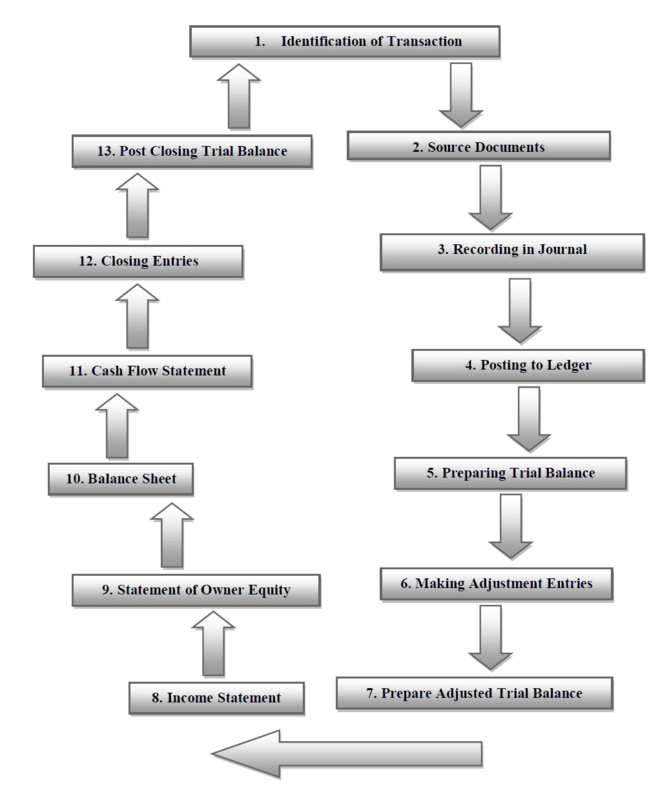 The Accounting Cycle refers to completed sequence of Accounting steps and procedures which are required to be repeated in same order during each accounting period or accounting year. > > Study Journal Entry. Identification of Transactions is first step in accounting, only business transaction or economic activities are recorded (except drawing in case of non-corporate form of business). A transaction is a particular type of event, which can be expressed in terms of money and brings changes in the financial position of a business unit. A transaction involves transfer of something of value between two or more entities. A transaction may be an exchange in which each party receives as well as sacrifices values; in other words, in every transaction, there is a movement of value from one source to another. A transaction can also be non-reciprocal transfer in which a business unit incurs a liability (penalty imposed by government) or transfer an asset to another entity (payment of income tax) or receives an asset (subsidy received from government). Transaction may be external (between business and second party) or internal (not involving second party like depreciation on machinery). >> Practice Accounting Cycle Quiz 1 and Quiz 2.